According to Gartner, Inc., the worldwide mobile advertising revenue will reach $11.4 billion in 2013, up from $9.6 billion in 2012. Global revenue will top $24.5 billion in 2016 with mobile advertising revenue creating new opportunities. Facebook and Google are generating the biggest revenues. 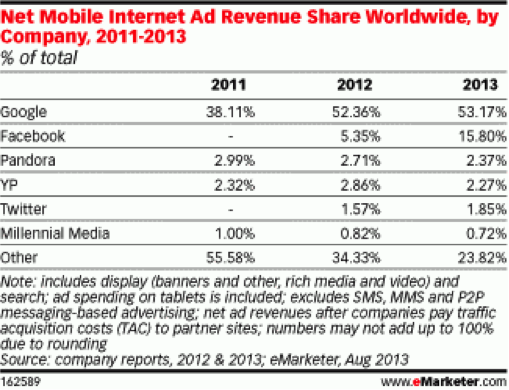 eMarketer predicts that Facebook will reach 15.8% Of Global Mobile Ad Revenue this year, up from just 5.35% in 2012. Facebook’s mobile ad growth is the consequence of the huge amount of ads published on the social network news feed in its mobile application. Facebook is fantastically growing its mobile advertising business, according to Kenshoo. Nearly 20% of all Facebook ad budget went to mobile. It represents a significant increase from October when Facebook announced that 14% of its ad revenue came from mobile. Also we can observe that 71% of Facebook mobile ad goes to Android, telling us that Facebook needs to focus on Google OS. Starting later this year, Facebook will be introducing a 15-second video slots for $1. Facebook is heavily used on a daily basis and allows advertisers to specifically target the demographic they’re looking for, which is why advertising on the site is worth so much cash, says a study from Consumer Intelligence Research Partners LLC. Across all devices, “Google remains the leader digital ad publisher in the entire world. Google will again take a stunning 33% of all mobile ad revenue this year, according to eMarketer. It’s the second year in a row that Google has dominated mobile advertising. And it’s the second year in a row that Google’s competitors for mobile ad dollars — Facebook, Twitter, Pandora, Millennial Media, and others — look like small players compared to the search giant, says Business Insider. GMIC, the Silicon Valley’s largest mobile conference, will be hosted at the Moscone Center On October 21-23. It will be a unique occasion to learn about how to generate revenue through mobile advertisement. For this occasion, Hubtech21 offers a special package to all mobile-bases startups. SIGN UP and we’ll get in touch with you shortly.